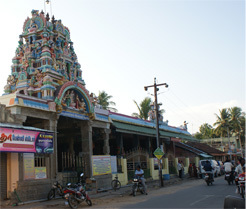 Karaikal Ammaiyar temple is located in Barathiar Street, in the center of Karaikal. 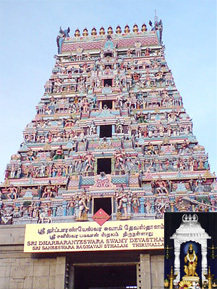 The main Goddess is Punithavati, also known as "Karaikal Ammaiyar". 'Mangani' festival is celeberated every year during the month of June-July ie. the day of full moon falls on 'Aani, a tamil month. Eventhough sani bagavan is lot temples all over the world the one at thirunallaruis predominant.Sani Peyairchi festival in this temple is a mega festival in which sani bagavan moving from one sign to another sign.This temple will remain opened from 6.00AM to 1PM and 4AM to 9.00PM only on saturdays it will be opened untill 2.00PM in the morning session. 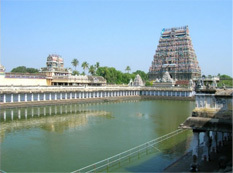 The Lordess Abirami has come as Amman Sakthi from Lord Mahavishnu's ornament (necklace).Thirukadaiyur is the place where Lord Shiva has bestowed immortality to Sri Maarkandaya and best owed with Ever Sixteen Age (16). For example Lord himself killed the God Yaksha (Yaman) and saved his votary's life. He has also bestowed yama with the Absolution for the sake of the Goddess Bhumadevi. Thirukkadaiyur is further purified by the holy trees like Pinchilam (2000 Years Old Tree) and Bael tree (Vilvam tree). Chidambaram begins with the legend of Lord Siva strolling into the Tillai Vanam ('Vanam' meaning forest and 'tillai' trees - botanical name Exocoeria agallocha , a species of mangrove trees - which currently grows in the Pichavaram wetlands near Chidambaram. 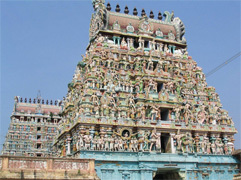 The temple sculptures depicting the Thillai trees dates back to the 2nd century AD). The temple occupies an area of about 51 acres. Four imposing towers rise on the four sides of the temple. Each of these towers rises to about 135 ft and is comprised of 7 storeyï¿½s and are topped with 13 copper 'Kalasam' (finials). The entrances at the base of these towers are quite large rising at least to a height of 40 ft. The outer perimeter wall is about 30 ft high enclosing the outer 'street' (veedhi) and the inner enclosures (praharam).